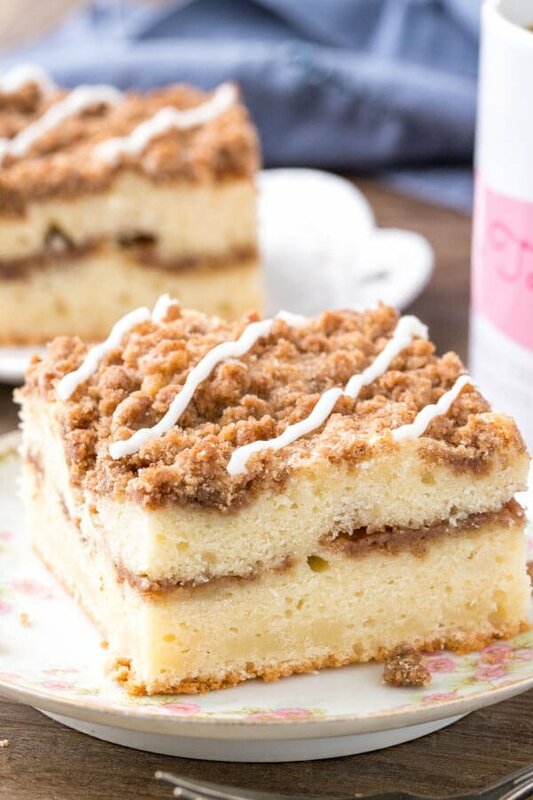 This easy coffee cake recipe is moist and buttery with a ribbon of cinnamon in the middle and brown sugar streusel topping. 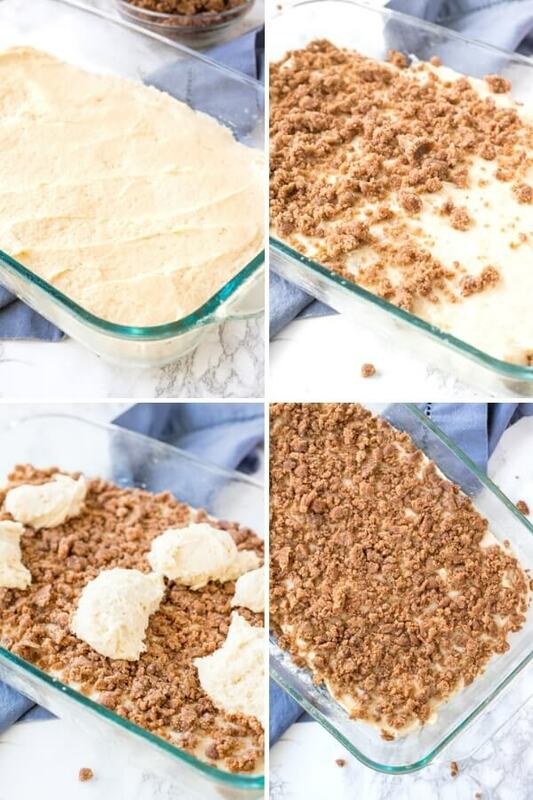 It has a deliciously tender crumb because it’s made with sour cream and the cinnamon streusel doubles as the filling and topping. 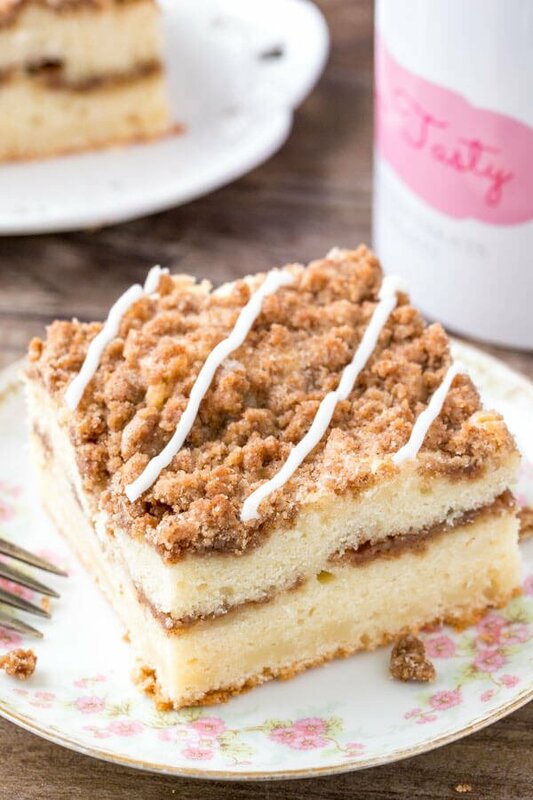 Perfect for breakfast or brunch – everyone loves this classic coffee cake recipe. Today we’re making a classic cinnamon coffee cake. 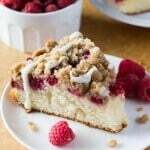 It has a rich vanilla flavor, cinnamon filling, crunchy streusel topping, and a drizzle of glaze. The glaze is totally optional but definitely recommended. You’ll love how the moist, tender crumb pairs with the cinnamon streusel. Enjoy a slice with a cup of hot coffee or tea – and you’ve got yourself one delicious treat. Coffee cake is a dense, buttery, moist cake that’s designed for eating at breakfast or brunch. 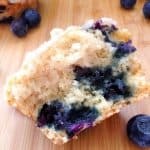 Instead of being frosted, it’s usually topped with a streusel or crumb topping. It can come in a variety of flavors, but the most traditional version is a buttery vanilla cake with cinnamon streusel topping (which is what we’re making today). So to answer your question – no, coffee cake doesn’t have coffee in it. Although, I suppose you could make a coffee-flavored coffee cake. For today’s recipe – we’re making a dense vanilla cake with cinnamon filling and cinnamon streusel. The streusel topping is also used for the cinnamon ribbon in the cake batter, which saves you a few steps. If you want to get straight to the nuts & bolts – feel free to scroll down to the recipe card. But I’m outlining all the steps with tips & a little baking science to help you along the way first. In a small bowl whisk together 1 cup flour, 1 tablespoon cinnamon and 1 cup brown sugar. Set it aside as you make the vanilla cake batter. Whisk together the dry ingredients: 3 1/4 cups flour, 2 teaspoons baking powder,1/2 teaspoon baking soda, and 1/2 teaspoon salt. Be very careful to measure the flour correctly – otherwise, the cake can get dry. Whisk the flour first, then spoon it into a dry measuring cup and level off the top. In a large bowl beat 3/4 cup butter and 1 1/4 cup sugar until fluffy. I definitely prefer to use butter instead of oil whenever making a vanilla cake because it adds so much flavor. Beat in 3 eggs 1 at a time, then mix in 2 teaspoons vanilla extract. In a liquid measuring cup whisk 1 cup milk and 1 cup sour cream together. Plain Greek yogurt works instead of sour cream too. Mix the dry ingredients into the butter mixture a little at a time, alternating with the milk and sour cream mixture. I usually do it in thirds. Alternating between additions of the dry ingredients and wet ingredients ensures that the cake mixes together evenly and has a uniform crumb. First, we spread 1/2 of the vanilla cake batter into the bottom of a greased & floured 9×13 inch pan. Then take out about 1 cup of the streusel topping, and sprinkle it on top. I usually user slightly smaller crumbles for the middle layer. Spoon the rest of the cake batter on top, then gently spread it smooth over top. If a few of the crumbles come up, don’t worry! It’ll taste exactly the same. Then crumble the rest of the streusel over top. Bake the cake at 350F for about 30-40 minutes. 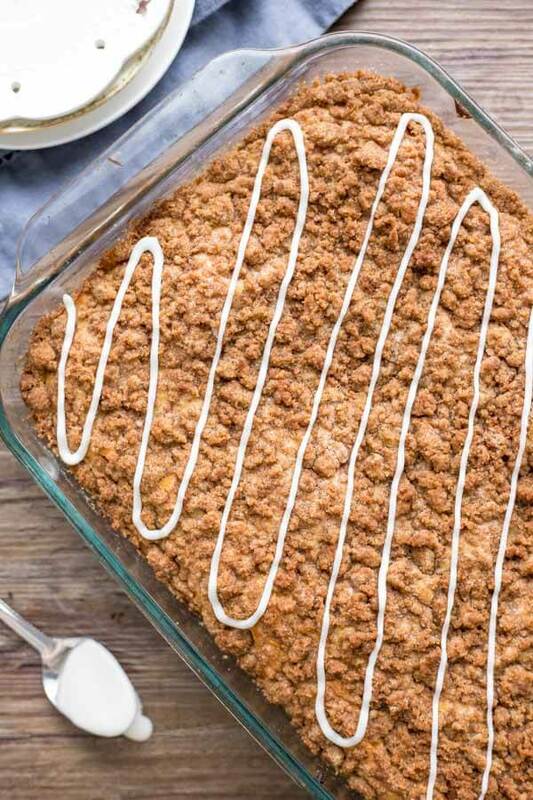 It can sometimes be hard to tell if the coffee cake is done because of the streusel topping. But when it’s done an inserted toothpick should come out clean and the cake shouldn’t wobble in the center if you give the pan a nudge. After the cake is done baking and cooling I like to top it with a little drizzle of glaze – but that’s totally up to you. It’s made with a little cream and powdered sugar and makes each piece just a little extra special. Be sure your butter, eggs, sour cream and milk are all room temperature before getting started. This makes everything mix together more easily without over mixing the batter. Do not over mix the batter. If you over mix the batter it can get tough and dry instead of tender and moist. I often mix in the last little bit of the dry ingredients by hand. Coffee cake is meant to be a dense cake – so the batter will be thick. Somewhere in between the thickness of cake batter and muffin batter. Don’t worry if the ribbon of cinnamon isn’t exactly centered – it’ll taste incredible no matter what. 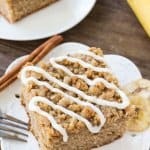 This coffee cake recipe is moist and buttery with a ribbon of cinnamon in the middle and brown sugar streusel topping. 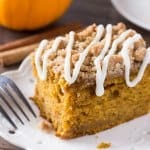 It has a deliciously tender crumb because it's made with sour cream and the cinnamon streusel doubles as the filling and topping. Lightly grease and flour a 9x13 inch pan. Preheat the oven to 350F degrees. In a medium bowl stir together the flour, brown sugar & cinnamon. In a medium bowl whisk together the flour, baking powder, baking soda & salt. In a large bowl using an electric mixer beat the butter and sugar until fluffy. (about 2 minutes). Mix in the eggs 1 at a time, then mix in the vanilla extract. In a liquid measuring cup whisk together the sour cream and milk. With the electric mixer on low speed beat about 1/3 of the flour mixture into the butter mixture, alternating with about 1/3 of the sour cream and milk. Repeat the process until combined, turning off the mixer and scraping down the sides of the bowl as necessary. Spoon about 1/2 of the cake batter into the bottom of the prepared pan. Smooth the top. Sprinkle about 1 cup of streusel mixture on top of the cake batter. Spoon the remaining cake batter over top of the struesel, then gently spread it over top. Crumble the remaining streusel over top of the cake batter. 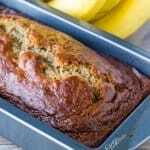 Bake in the preheated oven for 30-35 minutes or until an inserted toothpick comes out clean and the cake doesn't wobble if you give the pan a gentle nudge. 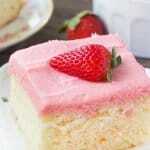 Allow the cake to cool for at least 30 minutes before cutting into it. In a small bowl whisk together 1 cup powdered sugar with 3 tablespoons of cream. If it seems to thin, add a little more powdered sugar. If it's too thick, add in a little more cream about 1 teaspoon at a time. Coffee cake is best enjoyed the same day as its baked. Coffee cake can be wrapped tightly and frozen for up to 2 months. Thaw in the fridge overnight. Then serve at room temperature. To reheat - remove any plastic wrap, cover with foil and bake in a preheated oven for 5-10 minutes at 350F.